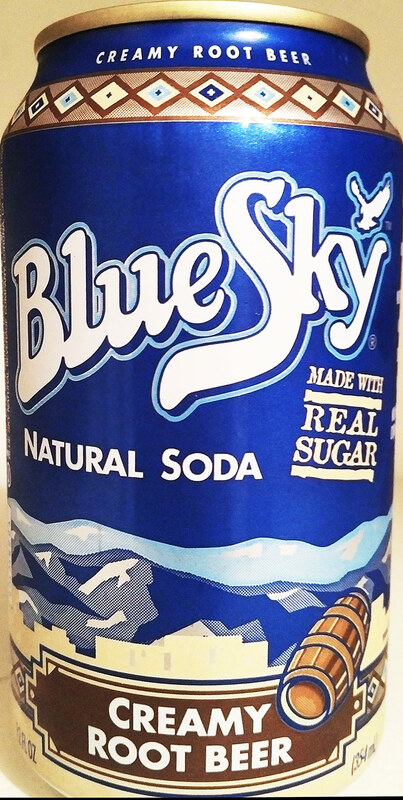 Blue Sky has been recommended to me as the pinnacle of easily available, affordable root beer; gourmet without the scarcity, if you will. Well, I’ve been putting it off in favor of more obscure brews, but now I’m here to give it a try. As I’ve said in the past, I have a predisposition against canned root beers. Plus, based on past reviews that brand themselves as creamy, I feel like I’m in the right to be wary. Nevertheless, this is the most highly recommended brew, so I have to give it a fair shake. Okay, let’s go! The can is absolutely beautiful, but it doesn’t really convoke traditional root beer vibes. Instead, it’s refreshing and it reminds me of a root beer float. The bright blue, and the crisp light-blue mountains in the background, are both enticing. The font choice, and the cityscape color scheme, reinforce and convey the “creamy root beer” mantra. Overall, the presentation is very well done. I hear the new branding of Blue Sky, which has most recently started filling shelves in my nearby grocery, completely undoes this. Oh well. At Blue Sky Beverage Co. real matters, and it has for more than 40 years. Since 1971, our beverages have been crafted for real; founded on an appreciation for blue skies and open air, honest ingredients and true to nature flavors. Our beverages have had a real loyal following that started simply with a couple guys and a van making deliveries throughout Santa Fe, New Mexico. The story provided by their website tells an interesting tale about an independent organization, and in fact, it appears that they were independent until 2000. At that time, they became part of the Monster Beverage Corporation. They’ve moved out of New Mexico and into California. Coca-Cola owns the world. Okay, there are far less ingredients here than I’ve seen in other root beers, but like the majority of brews out there, it’s still plagued by the term “natural flavors.” And, no, tagging it as “natural root beer flavor” doesn’t improve things here. You know what’s natural? Listing what’s in your drink. For being so highly recommended, and being branded as “real,” I expected more. Blue Sky has a satisfying crack and pop when the can is opened, but the smell appears to be a little weak. Although I can smell a hint of traditional root beer, I mostly smell the can. That doesn’t bode well. On first taste, however, Blue Sky is far from weak. More importantly, it tastes balanced. It’s good. It’s not overly sweet, but it’s not overly bitter either. The mintiness, unlike other brands owned by Monster, isn’t overwhelming. The carbonation is certainly present, but it doesn’t take over the brew. Blue Sky is balanced. I will note that I expected this to be very airy, and while there’s a definite creamy texture here, it’s not as distracting as other so-called creamy root beers. Something interesting that I’ve noticed about drinking Blue Sky over time, which is somewhat unique (and not all together un-enjoyable,) is that it’s a bit dry. It doesn’t make me thirstier to drink it, but there’s definitely not an overwhelming stickiness associated with this root beer. There’s also a complete lack of an after taste. I didn’t even think about trying a swish of water, because it was completely unnecessary. Over time, the brew loses a little bit of carbonation, and the bitterness seems to creep in, but the flavor stays fairly sharp. 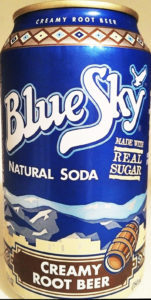 Blue Sky is a traditionally flavored root beer, which is balanced in almost all things, and is also quite good. I would grade it slightly under Polar. Because it’s so well balanced, I would go so far as to say it’s a solid root beer for all occasions. I could definitely see this being a common recommendation for first timers and long-term root beer lovers. If you have a chance to grab Blue Sky near you, do so.